Source: Unpublished update to Corrado and Hulten (2010) using methods and sources developed in Corrado and Hao (2013) and in Corrado et al (2016) and Corrado et al (2017) for INTAN-Invest© and the SPINTAN project, respectively. The SPINTAN project was funded by the European Commisson FP-7 grant agreement 612774. 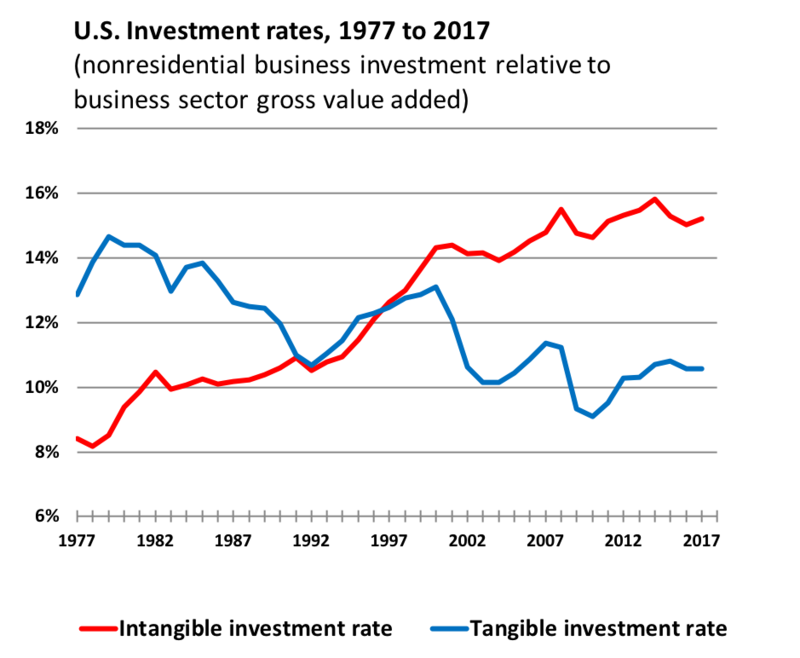 Notes: these U.S. estimates of intangible investment cover the business sector, similar to the coverage of the Bureau of Labor Statistics multi-factor productivity measures. They differ from the U.S. INTAN-Invest estimates, which are harmonized with estimates available for the EU. INTAN-Invest covers the total economy save NACE industry sectors O, P, Q , T and U. The U.S. National accounts data used to develop these estimates are as of August 31, 2018. Corrado, Carol and Janet X. Hao (2013), “Brands as Productive Assets: Concepts, Measurement, and Global Trends.” WIPO Economic Reseach Working Papers 13 (November). Corrado, C.; Jonathan Haskel, Cecilia Jona-Lasinio, and Massimiliano Iommi (2016), “Intangible Investment in the EU and US before and since the Great Recession”. Chapter 2 (pp. 73-101) in Investment and Investment Finance in Europe 2016. Luxembourg: Economics Department, European Investment Bank (November). Corrado, Carol; Jonathan Haskel, Massimiliano Iommi, Cecilia Jona-Lasinio, Matilde Mas, and Mary O’Mahony (2017).“Advancements in Measuring Intangibles for European Economies”, Eurona (Issue No 2/2017).